On 18 October the 19th National Congress of the Chinese Communist Party will kick off, and the new makeup of the Politburo Standing Committee (PSC) will be revealed. The policy direction and success of President Xi Jinping's next term depend on who makes the cut. A mostly informal set of rules govern eligibility for a spot on the PSC. One important convention holds that promotion to or retention on the committee is dictated by the candidate's age when the National Congress is held. This precedent, started and upheld since 2002, is encapsulated by the catchphrase 'seven up, eight down' (七上八下) – if a candidate is 67 at the time of the congress, they may advance upwards in the ranks. If a candidate is 68 or older, they probably expect to be retired. In theory, this norm precludes five out of seven members from staying on the PSC this October. According to the age norm, only one member of the PSC (apart from Xi, aged 64) will not be of retirement age come October: China's second-in-command, Premier Li Keqiang, who is 62. If the age precedent is upheld, which candidates will fill the remaining five spots in China's leadership? How will the leadership line-up change? What the age rule means in practice has sparked a flurry of speculation in the run-up to the National Congress – but perhaps a more illuminating question is whether Xi will uphold the 'seven up, eight down' convention at all. Last October, Deng Maosheng, a senior Party official from the Central Committee's Central Policy Research Office (overseen by one of Xi's top policy advisors), called the notion of a binding rule on age 'folklore', saying that age limits 'are party practices that can be sometimes adjusted as needed'. Since then, speculation has been rife that Deng's statement aimed to create space to bend the rules, perhaps to keep one man in particular by Xi's side on the PSC: Wang Qishan. Wang, who will be 69 by the time of the National Congress, is the PSC member for whom Xi would be most inclined to negotiate an exception to the age norm. Wang's achievements stand in sharp relief against those of his colleagues. He has spearheaded Xi's signature anti-corruption campaign, cleaning up the Party and eliminating Xi's opponents, and has gained a reputation as a 'firefighter' due to his deft handling of economic, political and health-related challenges. He may be one of Xi's most irreplaceable allies. Xi could easily argue that Wang must stay on the PSC because he is the lifeblood and sine qua non for the success of the anti-corruption campaign, which is still ongoing. But Xi might also be keen to knock the age convention on the head so he can put Wang's 'firefighting' ability to use in new, more critical roles. 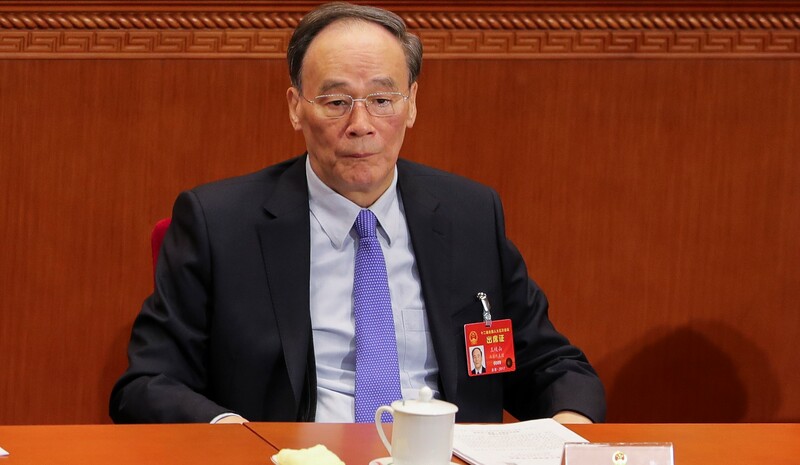 If 'everything Wang Qishan touches turns to gold' (as one senior government official reportedly put it) then why not install him as head of a new National Supervisory Commission? Or even as Premier, in place of Li? In a poll conducted by Sinocism's Bill Bishop, 66.4% of respondents believe that Wang will stay on, suggesting that about two-thirds of China-watchers think that Xi will override the 'seven down, eight up' norm and keep long-time ally Wang Qishan on the PSC. If Wang remains, Xi will be breaking with a 15-year precedent – but it's hardly a doctrine steeped in Party tradition. CSIS's Christopher K Johnson argues that former President Jiang Zemin introduced and used these age rules for political purposes to eliminate his rivals, and that his successor Hu Jintao adhered to the convention because of his 'political impotence'. Xi might feel confident breaking with precedent, especially with the greater authority that his entitlement as 'Core Leader' has brought. But after five years at the helm of an anti-corruption campaign that has seen over a hundred high-ranking officials arrested, Wang may well have more foes than friends in the Party, making the retention of Wang a challenge for Xi. Ultimately, breaking with the status quo might cause a headache for Xi inside the Party, but one that he can probably manage and endure for the stability that Wang's skills promise. For Xi, any type of instability is a failure. In this context, keeping Wang on could help Xi weather the economic, political and social challenges that lie ahead. Though breaking with the age norm would signal that Xi's power is not constrained by informal precedents, it could also reveal a dependence on Wang – not just a desire but a need for him to remain. But there still remains a sizeable chance that Xi does not have the stomach for a tussle over age norms. In the 'Wang retires' scenario, Xi might instead concentrate his political capital in the traditional horse-trading that precedes the National Congress by brokering deals within the Party and ensuring eligible and loyal allies have a place on the Politburo and its Standing Committee, stacking the odds in his favour. He could plausibly mix these two – retain Wang and stack the PSC full of his allies. But this is perhaps the hardest option of all. It would require a high-octane performance from Xi, as he would need to build consensus in his favour without making too many concessions to his adversaries within the Party. This is not inconceivable for a man who has gained a reputation as 'Chairman of Everything', but it would certainly be a challenge. The way in which Xi deals with the age question in the make-up of the PSC will be a good indicator of the nature of his power and the extent of his success. It will indicate if and when Xi is willing to compromise, his future policy priorities and perhaps even his political insecurities.